Pesticide label references available online! This cold and snowy weather hopefully has everyone dreaming of warmer days this spring. The 2019 growing season will be here before we know it, but now is a great time to plan for the year. While many farmers have already purchased pesticides for the growing season, it’s important to read the labels for these products before use. I always suggest that farmers read pesticide labels prior to purchase, in case there are restrictions or label requirements that would make an alternative product more desirable to use. There are a couple excellent resources available on the internet for referencing pesticide labels before the product is in-hand this spring. I’ve outlined the options below and different ways to use the websites. 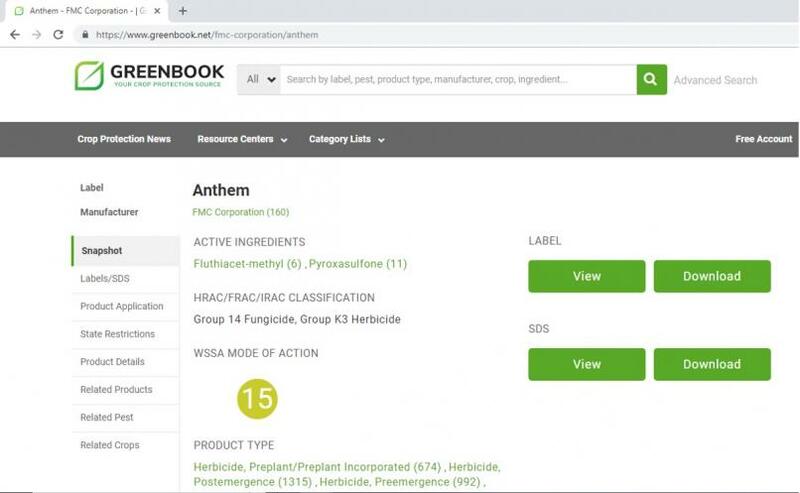 Use the product search bar to look up pesticide labels by the trade name of the product (i.e. Spartan, Roundup). If you aren’t certain of the entire name or spelling, you can search for partial names or just a few letters in a sequence to bring up a larger list and then select the correct one from there. Click on individual manufacturers listed below the search bar and look at all the products each one has available. 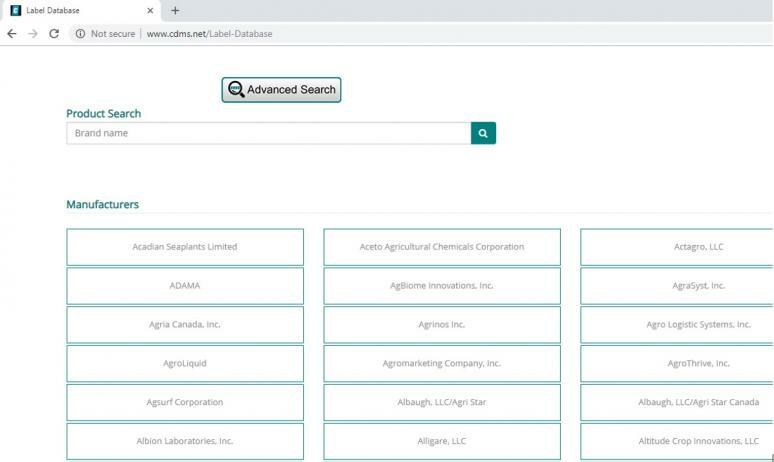 Use the ‘advanced search’ feature to find products that are labeled to manage a particular pest and are approved for use in Iowa. Figure 1. CDMS website label database page. This website contains labels for products used in the United States as well as Canada, so take care that you do not click on the Canadian version of the product label (Figure 2). Once you have clicked on the product you want to read more about, the page should look like Figure 3. You can see this product, Halex GT, has two labels, but one is pending approval in California. It also has other labels that might be state-specific or crop-specific. Finally, the material safety data sheet (MSDS) is available to look at. Figure 2. All matching results appear when searching for product trade names or partial product trade names. Notice the Halex GT herbicide label appears for both the U.S. and Canada. Figure 3. Labels and safety data sheets available as PDFs for each product. Once you click on the label you want to look at, a PDF version of it will appear in a new tab in your internet browser. You can zoom in on the label to make the font larger and easier to read. 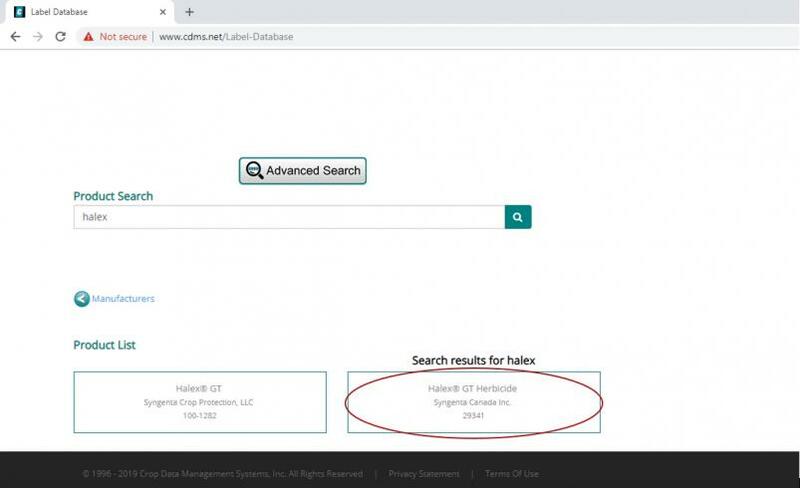 You can also search most PDF labels for specific words or phrases by pressing CTRL + F on the keyboard and typing the word or phrase into the search bar that appears. This website works very similarly to the CDMS website, but the search function is a little more diverse. On the homepage of this site, the search bar allows users to input product trade names, active ingredients, manufacturers and several other options. Again, users can type in partial words, but this search function will try to finish the word below the bar, allowing you to click on the correct option right away. For example, I wanted to search for ‘pyroxasulfone’, a herbicide active ingredient found in several products. 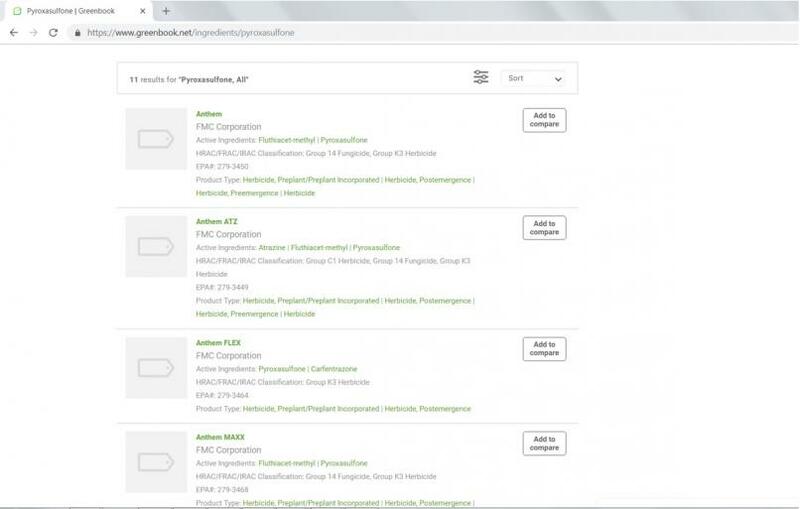 Figure 4 shows how the website used my input to come up with a list of matching chemicals, so I could just click on pyroxasulfone in ingredients. When I clicked that option, the website brings up 11 products with the active ingredient pyroxasulfone in it (Figure 5). From there, I can select the product I want to look at and choose the label I want to read (Figure 6). 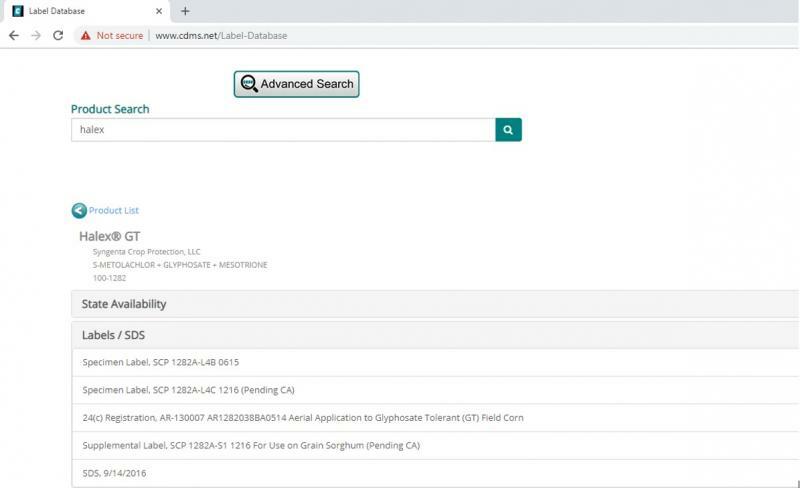 These labels open in a PDF format, just like the ones on the CDMS website and you can zoom in and use the search function in the same manner. Figure 4. Greenbook website search function will try to complete partial words. Figure 5. The website found 11 results for products containing the active ingredient pyroxasulfone. Figure 6. Individual product page has information on the product and its uses, labels for viewing or download, and the material safety data sheet (MSDS). These websites are helpful tools to use in planning prior to the start of the growing season by allowing you to look at product labels prior to purchase and prior to the arrival of products in the spring. 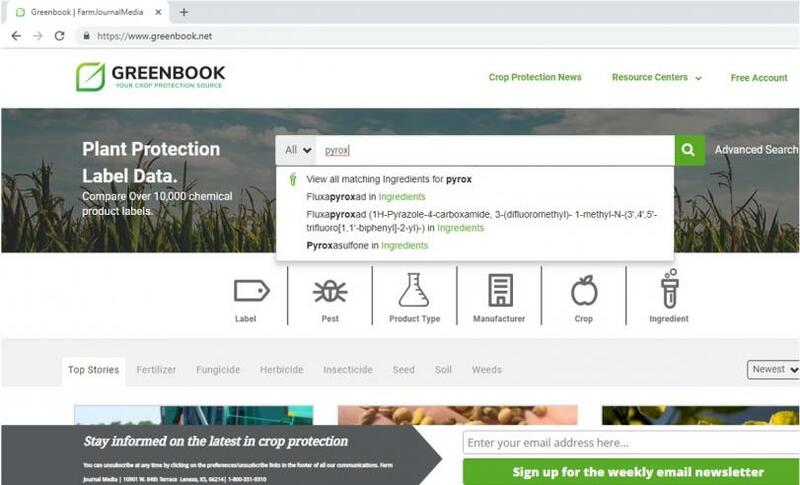 If you have any questions about accessing these webpages and looking up pesticide labels, please contact your local extension field agronomist.